Today I present to you another accessory retailer that I have fallen head over heels for, T+J Designs. Not only did they capture my heart with their designs and prices, but also because they are two women living out their dream. These brilliant women own their own accessory company and they are bloggers too; spreading their love for fashion in as many places as they can. They have been featured in Lucky, Glamour and Seventeen magazines. That is just the short list. I can guarantee that once you click over to T+J Designs, you are going to discover pieces that you can't live without. From statement necklaces to bangles to stackable rings; the prices and pieces won't empty your bank account. They offer free shipping on all orders over $20 and when you join their mailing list you will receive a $10 credit on your next order. Below are a handful of designs that immediately caught my eye and will hopefully be added to my growing accessory collection. A girl can never have too much jewelry, right? T+J Designs is offering you the chance to win a $40 credit to their online store. Make sure to enter with the Rafflecopter below. P.S. Thank you once again to everyone for all the love on Friday. I am still on cloud nine from the big announcement. I read every single email, comment, tweet and message you guys sent me. Besides my wedding day and the birth of my two babies, Friday was the BEST day of my life. Thank you, Wallis. I can't wait to travel across the pond next week! Now, what the heck do I pack? Help!?!? love their gold rose classic bangle.! I would love to get my hands on the Luxe Pearl & Crystal necklace. Luxe Pastel Bib for sure! i LOVE this necklace! You look great :) thanks for the giveaway! Love the outfit! (I actually have the same shirt and skirt, now I just need the necklace) I love the chunky bracelets and the bib necklaces. Thanks for the giveaway. Thanks for sharing them with me!! I would love to have the Luxe Gemstone necklace, oh so pretty!!! Awww I'm loving your outfit! So pretty! Cute skirt :) Love how it gives a pop of color to this outfit. And those shoes are pretty amazing too! I really like the double wrap black/silver & black/gold chain link bracelets and pave chain layered set =) Great giveaway, There jewelry is amazing! Great inspiration! I love the necklaces too! I just bought a pair of pink shorts like that from Old Navy and I have that shirt. I can totally rock that now. I would never had put them together either. Thanks! Ok, first off...this cutie cute skirt! Love it!! And I have my eye on the Lemon drop necklace for sure! I love that plaid top! So cute with that hot pink skirt... and again so many congrats - that is beyond exciting!!!! Omg. I pretty much NEED all of the necklaces. LOVE. I love the Minty Drop Necklace and the Floral Austrian Crystal bracelet! I love the "delicate deco" necklace!!!! Kinda has a vintage vibe! 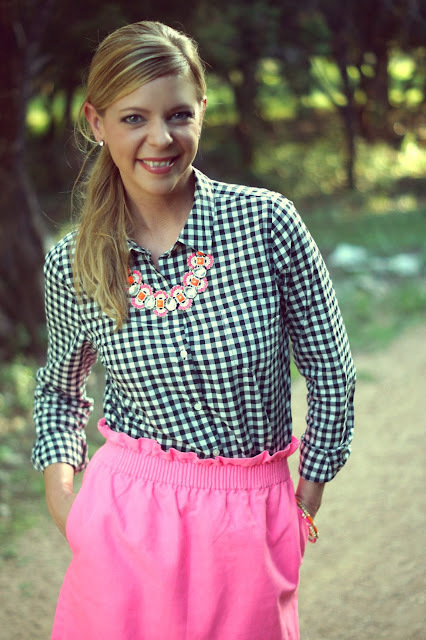 Love your gingham and pink! I have worn a similar look and loved it. That skirt makes your legs look SO long and lean!! I should have tried it on a JCF this weekend. As far as the giveaway...YAY! But how do you choose just 1 favorite?! I like the 3 gem necklace and the silver pave link necklace too (among SO many others!). Ooh, so many great necklaces. Especially love the Mint Resin & Crystal Necklace. I own this top as well and I love that you paired it with the bright pink skirt! I would choose the bold neon necklace you featured above in orange/pink! My favorite is the one that you're wearing and the Luxe Sapphire Blue Crystal Necklace! I looked around their awesome site...but I think you picked my favorite! I LOVE that necklace! This skirt is super cute. I entered the giveaway- fingers crossed! Loving this outfit! I've never heard of this jewelry line but really love their items and especially the prices! I love the pastel lux necklace!! Love your outfit!! I think I'd choose the Three Gem Chain Necklace in Blue! Love all the T&J pieces! You are going to have a lot of fun in London! Can't wait to see all the pictures. I recommend if you are able to have any time to sightsee for sure get one of those 24 hour open top bus tour passes. You just ride around on it, getting on and off every where it stops. I saw tons of sites that way and if you sit on the top and have a great tour guide it makes it even better. I love the pastel luxe necklace. I've been admiring it for a little while now. Love the neon pink and orange bauble necklace. Perfect for summer! I promise I'm not trying to make my odds better by blowing up your comment section, I just didn't follow the directions the first (or second!) time. Guess third time's the charm! I would love to have the Luxe Pastel Bib Necklace or the Neon Bangles..Neon is so trendy this year! Love that skirt! So happy for your dreams coming true!!! This look is absolutely adorable! Love the treo stack ring and the luxe pastel bib necklace! I love the Gold Pave Link Necklace. I love the Rose Gold Tassel drop earrings for sure! I love the Melissa Bracelet set. I don't have a bow bracelet, so this would be perfect! I think i'd go with the pastel bib necklace! I would probably choose the Druzy Pink Teardrop Necklace - so perfect for spring! I have that same skirt! I would get a fun summer necklace! Oh love this! and i still need your j crew skirt. I would go for the bold neon! I LOVE that necklace! It just screams summer. I'd probably get the pink geo necklace. So cute! Great giveaway! Pack your wallis top.. That would probably be a good place to start. Super cute as always Shanna! Can we be BFF's?! I LOVE the Spike Crystal necklace! Love this giveaway! I've been eyeing their gold pave necklace for AGES now! Love T+J Designs. Especially their necklaces. Gorgeous! I know I can't have too much jewelry! So many adorable things on the site; I think I'd choose the Rachel bracelet set. I can't believe you're going to London so soon! I'm so thrilled for you! So many pretties to choose from! I love the Druzy Neon Pink Teardrop Necklace! I love those necklaces!! So Springy!!! I would love the golden cluster necklace! I may get the Gold Crystal Heart Studs. Light Blue Petals & Pearl Necklace is beautiful! I have this top too! Love it on you! I would most definitely love the pastel colored bib necklace!! Thanks so much for the fabulous giveaway! Pearl and Crystal Cluster necklace is gorgeous. Wow. They have some really beautiful stuff. You look adorable in your outfit. Such an awesome store! Can't wait to use the $10 credit! I can't choose between the red petals and pearl necklace and the gold textured link bracelet)! I'd get the Three Gem Chain Necklace! I hope it's not possible to have too much jewelry because if so I'm getting close to my limit! Pink feather pendant. I love it! Cute fit! I like the neon necklace you've shared and also the white gold pave rectangle necklace. Ugh, I love them all but if I had to choose it would either be the yellow or orange and pink bauble necklace. So beautiful! Love this skirt and gingham top, it is so cute! LOVE your look!! What ar eyou going to pack!! SO fun! Love T+J! I've been on the hunt for some new neon jewelry. I definitely get the Neon pink and orange necklace you styled. Love it! I like the neon yellow bauble necklace! So many cute pieces it's hard to decide! Loving the Luxe 18K pave link bracelet in gold!!! I would get the Ashley bracelet set! And if I win I would get the Pink and purple chain collar necklace! I love the pave link bracelet. Great giveaway. Thanks dear, and your new design looks great! yep, definitely would want that feminine pastel necklace! gorgeous!! I love the neon necklace. I would love to put it toward the pink and orange bauble necklace. So cute! Love the Emma bracelet set, as always thanks for the giveaway! I think I'd have to go with the necklace you're wearing in these photos. So bright and fun! I love the pastel bib necklace! Perfect for Spring. Love LOVE the Luxe Pastel Bib necklace from your photo. And the Heart & Bow Trio Stack ring! That skirt is such a gorgeous color & fit on you Shanna! Loving your new blog design too -- it's very simple & chic! Your outfit is soo cute! Really love how the pink skirt brings out the plaid. The Pave Chain Layered bracelet set is just my style! Also, I adore your outfit today. The black/white gingham plus bright pink is so fun. I also forgot to add that we have the same skirt except mine is the striped one. TWINS. Very cute, their jewelry is ADORABLE! Not sure when the blog design was updated, but I ABSOLUTELY LOVE IT!!!! I love how clean and chic it is, just like you!! I love the neon yellow bauble necklace! Still over the moon for you about your awesome Friday news! I love the Pink Square Gem Earrings! I love the pink highlighter Necklace. Thank you for a wonderful giveaway! the Floral Austrian Crystal Bracelet! Pink + b&w... chic for days my dear! Loving your newly spiffed site as well! Congrats on the Wallis ambassador win!! the gold double crystal necklace needs to be mine!! I would love to get the Green Petals & Pearl Necklace! Oh Mrs. Ambassador.. adorable outfit as always! and love the new blog look!! I would love the Gem Chain Necklace! Hey girl, looking fab as always! I love t and j designs. I've been following Tiffany's blog for some time. I love the trendy yet classic pieces. I would totally splurge and get a link bracelet! TO DIE! I really like the pink feather pendant. And btw, your shoes are HOT, Shanna! I love the druzy teardrop necklace! Ohh I love everything about this outfit. I have been eyeing that skirt but have held off since well it wouldn't fit for awhile! Cuuuute outfit!! I like the chain link necklaces, but I also really like the luxe pastel bib necklace! Very cute outfit! I love the shoes and the necklace! I like the neon teardrop necklace! The feminine pastels one is so cute! I would love the Deep Rose & Black Square Stone Bangle Set! looove the luxe pastel bib necklace!! LOVE their enamel bow bracelets! I love the Luxe 18K Pave Link Bracelet. I really love the pastel bib necklace-so gorgeous!